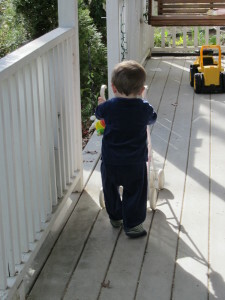 I wish I could adequately express, in words, what the emptiness of losing a child feels like. After the initial shock wears off, the pain becomes a thin veil that casts a pallor over everything in your life. Even after more than two years after the loss, its presence remains; a persistent, dull ache that takes permanent residence in the heart. There is nothing you can do to shake it off. Nothing. The only recourse is to try and counter the pain with happiness. Unfortunately, for the most part, those happy moments rarely bring you to the euphoric highs they did before the loss; instead merely countering the pain and “leveling you off”. Of course, engaging in these activities takes energy – and the irony lies in the fact that the pain saps that away too. It remains a constant struggle to try and keep the pain masked and all that work takes its own toll. I know that my few close friends recognize the toll it is taking. I can’t tell you how many people commented that, after looking at the pictures of me after Melina was born, I looked truly happy for the first time in two years. Those precious few are the ones who know me best and know how much of my perceived “strength” is really just a facade. People tell Samantha and I all the time about how “strong” they find us to be. The reality is that neither of us are really strong. We are merely struggling our way through an unimaginable experience for most parents. Every parent with whom we sadly share this sad connection with, and with whom I have had the chance to speak, tells me that others echo similar sentiments to them. It is not strength; its merely the perception of it framed from a point of view that one can only understand by experiencing the loss. I see the weakness in Samantha too – it just manifests itself differently in her. Sam is much better at putting up the facade of strength than I am. Sam’s laugh is so infectious that it fills all those around her with joy. I know that the laughter is sometimes a defense for her. I think she feels like if she can keep others smiling they can’t, or wont, notice her own pain. I wish I could just fix her pain somehow. If only I could just take it away from her and just pile it on to my own. I’ve already piled so much on, why not hers too? On December 19, 2010 my son was born. 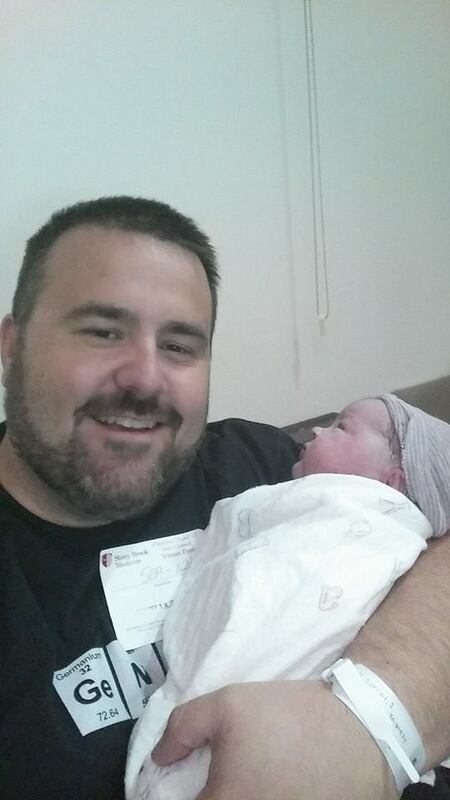 I was so excited to have a little boy. He made me smile from ear to ear and made us all happy every day he was with us. He woke up smiling and went to sleep in his crib each night with a smile. He loved Mickey Mouse, jake the pirate and tractors. I am so glad we went to Disney world the summer before we lost him. He was so happy and you could see the magic in his eyes. 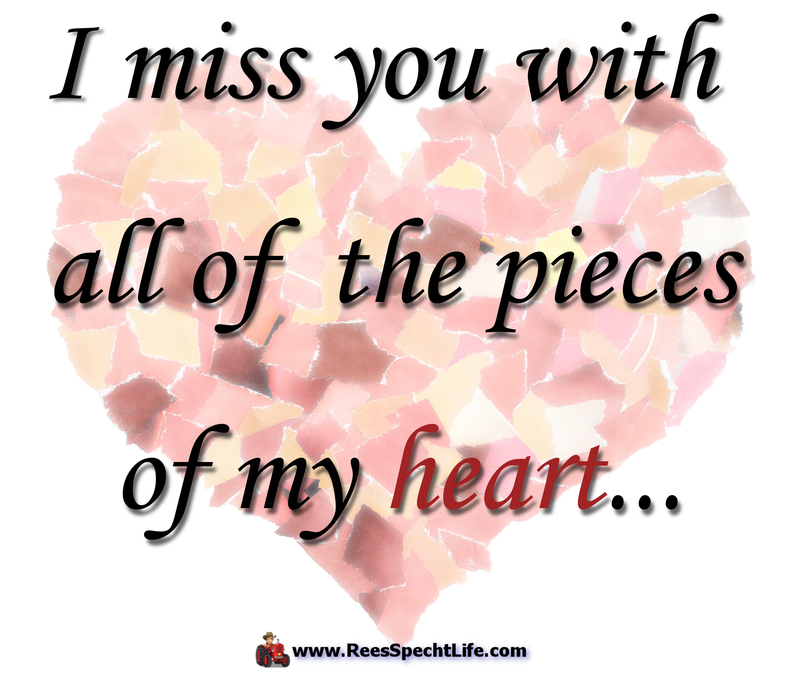 There is not a day that goes by that I wish I could see that smile again and hear his voice and giggle, to feel his arms around me and receive a kiss from my sweet son. I wonder what he would be into now. What would he be hoping to get on his birthday? Who would be coming to his party? How would we being celebrating? What would be his favorite meal that we would prepare for his special day? He would be turning 4. Where has the time gone. We were so robbed. We only celebrated 1 birthday with him. I have “celebrated” more angel days instead. It’s not fair but I can only hope that he knows how much we love him and miss him. Look out for your birthday messages tomorrow on your balloons. We love you sweet baby boy. To the moon and back my love. Do something kind for someone for my son’s birthday tomorrow. Sam is exactly right. We were robbed. Robbed of a lifetime of experiences that were supposed to bring us joy only to be replaced with sadness over the “what if’s?”. I was robbed of a best friend who turned his back on me when I needed him most. A friend who I stood by concerning the accident, but who cowered in silence when CPS hurled their accusatory slings and arrows my way, hoping to avoid any himself. 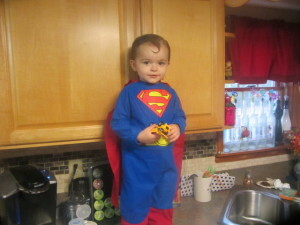 One day, ONE MOMENT, is all it took to rob Sam and I, and our entire family of a beautiful little boy. I would trade just about anything to have that one day back – but I know that is impossible. So now my “one day” takes on a whole new meaning. One day I know I will see him again. One day Sam will smile a smile that conceals no pain. One day I will hold him again. One day I will be able to forgive my friend for abandoning me when I needed him most. 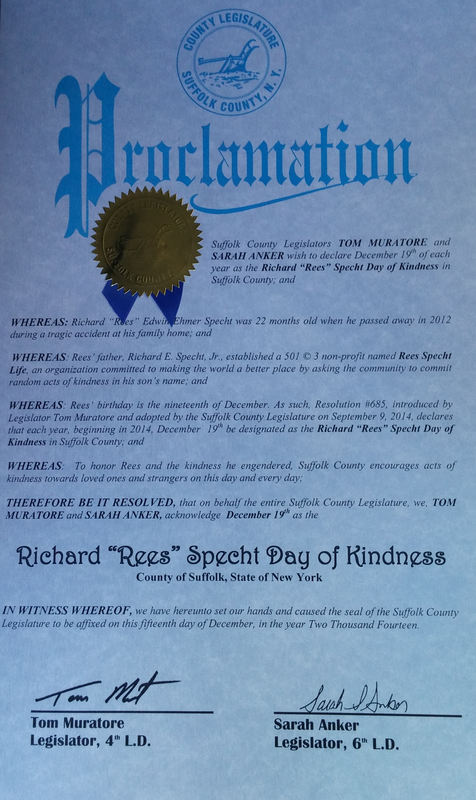 We are proud to announce that Rees’ birthday, December 19th, is now officially Richard “Rees” Specht Kindness Day in Suffolk County, NY. 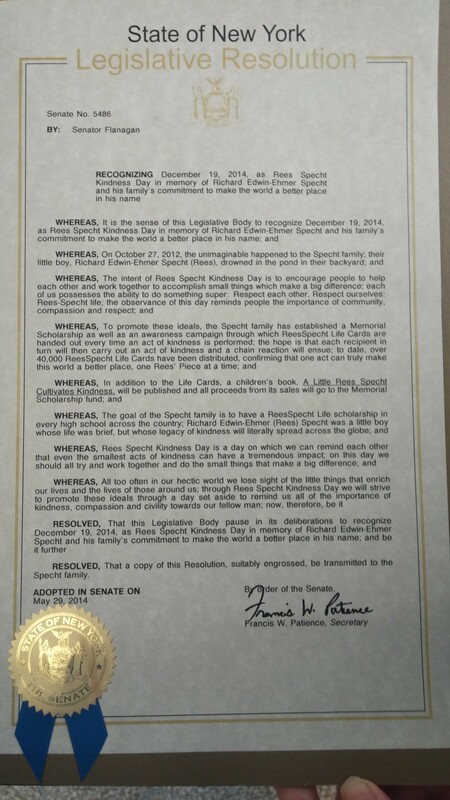 Samantha and I are honored that Legislators Anker and Muratore sponsored this proclamation making the birthday of our little boy “Kindness Day”. It is our hope that others will be inspired by the spirit of our little Rees to help make this world a better place, one piece at a time… This honor could not be better timed, as it helps to ease the pain of knowing that this friday would have been Rees’ 4th birthday. 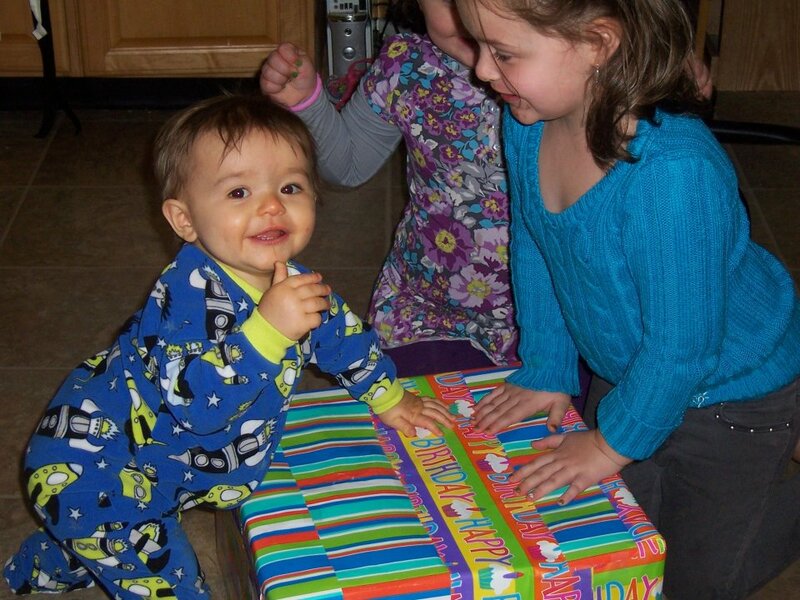 Happy Birthday in heaven little man. 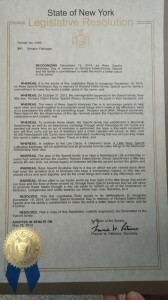 You have a day named after you… wow. Mommy and Daddy love you to the moon and back. Happy “Kindness Day”, Reesie. The anxiety created by constant fear is incredibly unnerving. It resonated within me at a fundamental level, and it was so ingrained that I felt I could not excise it, no matter how hard I tried. Regardless of the good we did through the foundation, or the length of time that separated me from the loss of Rees, the fear of emotional bombardment remained unchanged. I hated living in fear of my feelings. For almost two years I wanted to regain a fundamental sense of happiness that I could barely remember having existed in myself before we lost Rees. The asterisk I wrote about in “My life*” seemed like the new normal to me and the time before Rees’ death felt like the exception. I really didn’t think I could ever feel the peace I had before October 27th, 2012 and found myself resigned to living a diminished life. For almost two years I truly experienced just that: A diminished existence. That is until, in one moment, everything changed and I was reminded of the beauty of life and its ability to conquer death. 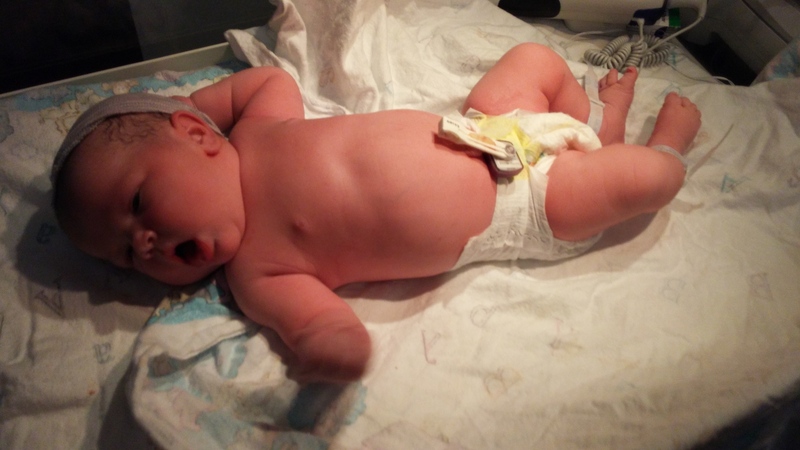 That moment was when I first met my third little girl, Melina Arya Specht. Melina Arya Specht. 10lbs 1oz. They say having a baby “changes everything”, and while I really don’t know who the heck “they” are – it turns out that adage is completely true. The moment my daughter Melina entered the world I experienced something I had not experienced, in any form, for the first time in 23+ months: pure, unadulterated, bliss. 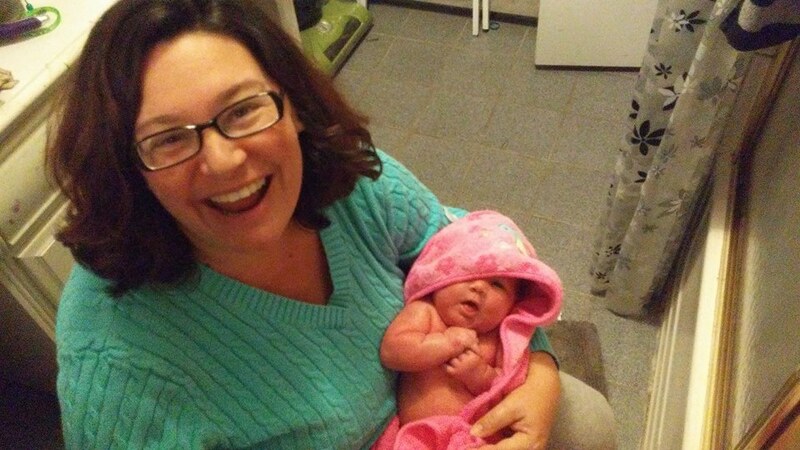 The joy in seeing her take her first breaths after emerging from the watery environment that nourished her for 9 months proved to be the metaphoric antithesis of the events that took my little boy from me. In her first moments of existence I was instantly reminded of what life is all about in the first place… renewal. Her literal birth became a figurative re-birth for my sense of hope: Her arrival a renewal that I could never have predicted. One singular moment creating an atmosphere that vaporized the fear orbiting me. That fear seemed to reach a crescendo right before her birth. Throughout the length of Samantha’s pregnancy we both took on air of “wait and see” – not believing that we would actually meet her…always waiting for something bad to happen. It was incredibly stressful and made those nine months feel like an eternity. From the moment we found out Sam was pregnant, we just felt like we could not possibly be happy again. 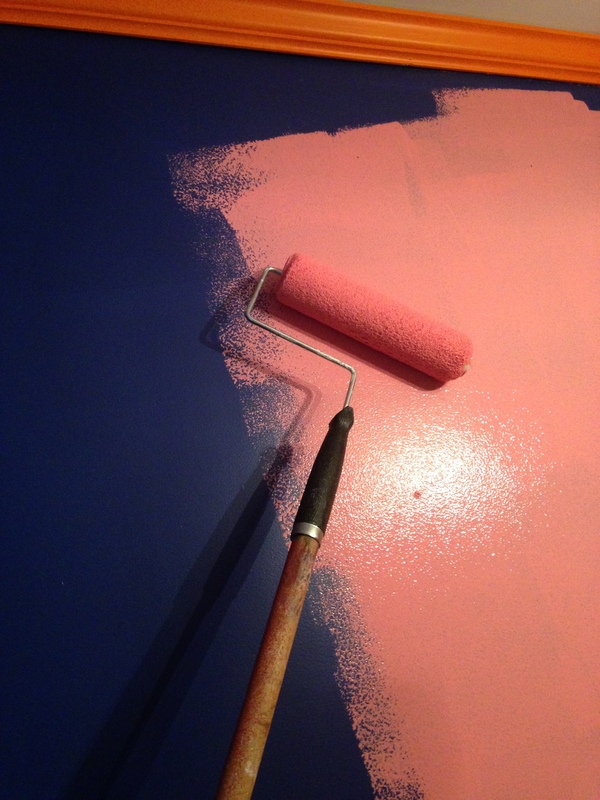 Nowhere was this feeling more evident than in my hesitance to repaint Rees’ nursery for her. After we found out Melina was a girl, I knew I would have to change the nursery from Mets orange and blue to something new, befitting our new little princess. The problem was since I had so much doubt and fear, I was afraid that I would paint the room only to suffer another loss – and be left with yet another painful reminder. I didn’t want to do it and put it off until I absolutely had to get the room done in order to surprise Melina (our former Au Pair whom Melina is named after) when she arrived the end of July. Painting that room was one of the most cathartic things I have ever done in my life. There was something deeply symbolic about covering the blue on those walls with the pink hues that would now define it. Before I started I felt like I would be erasing Rees in a way, but the opposite proved true – covering over the blue proved to be a reminder that life goes on, and that life is for the living. I wasn’t erasing Rees, I was coloring in a new page in the book of life. What also helped is that we kept the orange trim in the room as a gentle reminder (and incredible time saver!!! – I hate trim!!!). After completing the room, I found we opened the door again and it no longer served as a source of sadness – in fact it became the opposite; a source of hope. That all changed early in the morning on October 16th, 2014. As soon as I heard the first cry of my fourth child, a feeling washed over me like a scouring tide removing all the debris littering an unkempt beach. In one moment all the fear I had was wiped away, replaced with a feeling a pure joy no doubt magnified by the stark contrast to my previous disposition. Hearing her cry was the most life affirming moment I have ever experienced. The smile on Samantha’s face, unburdened by the pain that dwelled in her for 23 months, was the most beautiful thing my eyes have ever gazed upon. Right there, in that moment, life was ours to hold and embrace. The smile on my face, caught in my first selfie with Melina, is all I need to see the effect this little girl had on my soul. Nothing could be more perfect than that moment. Nothing. It is a point that I know will flash before my eyes when my time to reunite with Rees is at hand. Life conquers death and love is eternal. I experienced both at once. I sit here today a happy man. Despite all I have lost, I find myself happy for what I have now. Melina has given me a reason to appreciate what is a part of present, while Rees and Arty give me something to smile about in my past. Melina is a brand new life, a new hope, and I revel in the fact that she will grow up knowing her brother without having to share the acute pain the rest of her family has endured. Melina is in an enviable position, she will have the perspective of knowing the impact her big brother is having without ever having to have experienced his loss first hand. I talk about perspective with the students who I share Rees’ story with all the time, and even through that introspection, I failed to realize that Rees’ death fixated me on the idea that death ends life. Melina’s birth flipped my perspective again, helping me to recognize that from death comes life. Indeed, both approaches are completely true; the only difference being how you view it…with one exception: Life always finds a way. Life always wins. Her birth reminded me of that important distinction. I initially found myself disappointed by the notion that I would never have a little boy to play with again – I have come to realization that a little girl was perfect for us. I wont ever find myself comparing her to Rees. I will never make the subconscious comparison to her disposition vs. his. 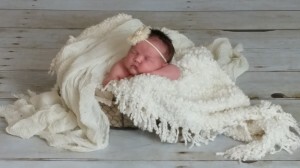 Our little girl is the perfect fit for healing our family. I truly believe that Rees had his hands in sending us a little girl the whole time. 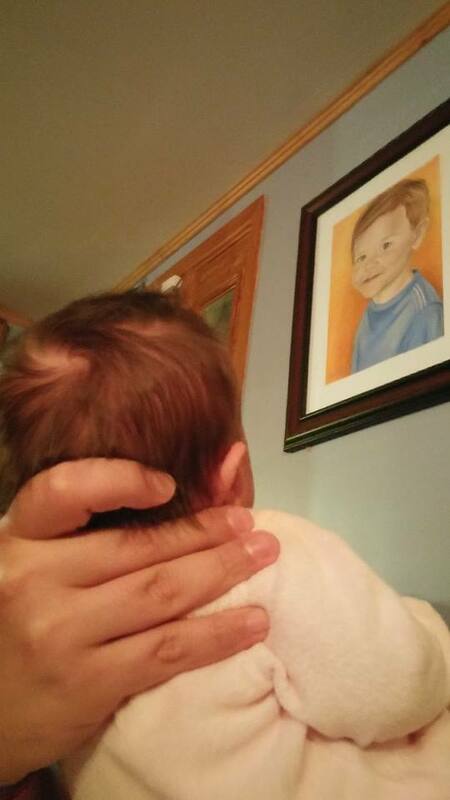 While I do wish that she had a chance to meet him, based on the amount of time I catch her staring at her brother’s portrait on the wall (and the familiar smile it elicits), I suspect she already has. We spent 12 of the 14 days after Rees’ death in darkness. Not a figurative darkness, a literal one. It took 12 days for the Long Island Power Authority to restore our power in the wake of Hurricane Sandy. For 12 days I sat in a dark, silent, house befitting my shattered and darkened soul. For 12 days I toiled about, much like other Islander’s, keeping my generator running, trying to figure out how to shower, and coming up with creative ways to create meals out of a rapidly defrosting melange of meats and veggies in our freezer. My family felt the same shock shared by most of the people in the tri-state area who suddenly found themselves with the first-world only problems of being cut off from our social networks, newsfeeds and favorite tv shows. 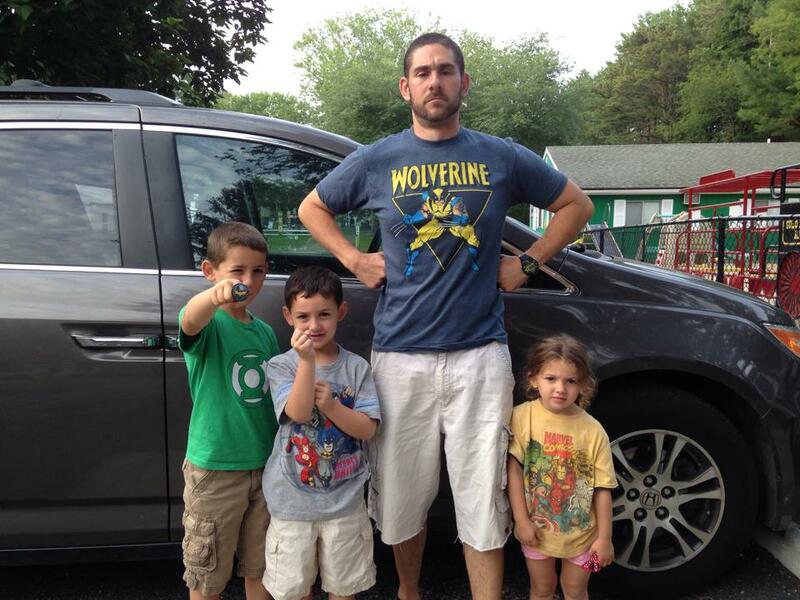 Superstorm Sandy was a shared dose of misery for almost every person in the Tri-State area. We felt all of it, and on top of it, we had to bury our 22 month old son, Richard Edwin-Ehmer Specht. When I look back on that storm, I can’t help but wonder “What if?”… What if that storm turned East instead of West? What if I had cleaned up the lawn furniture right when Samantha asked me to? What if I just went outside and put away the furniture while Rees was napping? What if I didn’t try to secure down those damned garage doors? What if I didn’t yell at my friend for letting Richie play with that stupid toy truck? What if I never let my friend back into my life years earlier when all of his other friends cut him loose for one reason or another? What if Rees wasn’t cranky that morning and Sam took him shopping like she intended? 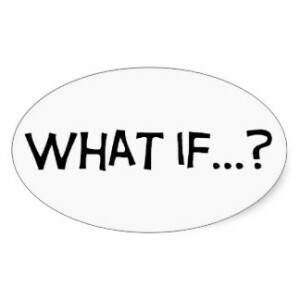 What if, what if, what if, what if…. there are so many what if’s – and truth be told, each of them arrives at the same end: Rees would, most likely, still be here today. That night was really what started our little movement. As soon as the power came back on I wrote “Why?” and mine and my wife’s mission of honoring our little boy and making a difference in the world in his name began. Everything that has transpired from that moment would not have happened if any of those “What if’s?” had different outcomes. If Rees was still here, none of this would be. In all likelihood, my third daughter, and fourth child, would not be due any day now if he was still here. If I ponder those “What if’s?” it forces me to make a choice between the good we have done in his name, and our selfish want to have him back in our lives. I cannot change the past. “What if’s?” are irrelevant. Acceptance is knowing that I can never have him back, so asking myself that question can only cause me distress. What if my children’s book doesn’t sell through its first run? What if I lose another person close to me? What if something happens to the baby? What if people just shrug their shoulders at what we are trying to do? What if my goal of spreading Rees’ story and kindness just dies? What if something happens to me before I achieve our goals? 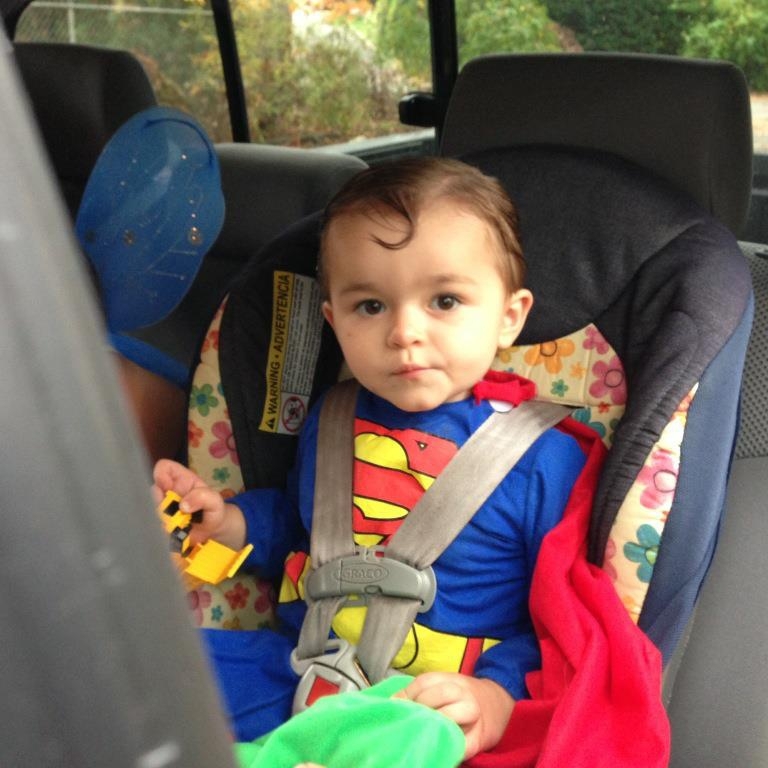 What if my little boy is forgotten? What if, what if, what if, what if??? – These questions, and many more, pop into my head on a daily basis. I try not to think about them, and I have tried to rationalize them away like the “What if’s?” of the past; but just I can’t seem to shake it. There are times I wish I had a crystal ball to see into the future. I want to know if this dream I have will play out the way I hope it will. I’ve lost so much in past few years, and I guess I feel like something has to start moving in the right direction now. What I really need to do is focus on the “what if’s?” that have a positive outcome… What if every goal I set out for this movement comes true? What do we then? I guess those positive “What if’s” are what hope is all about. In the meantime, I have the present to focus on “What now?”. How do you measure heart? What is a teacher? How do you measure the effect they have on the countless numbers of children whose live’s that teacher touches? How can I look back on the career of my dearly departed friend, Arty Miller, and properly evaluate his role as a teacher in our community? While at school, Arty was a teacher first and everything else came second. But what is a teacher? What makes a good teacher and why was my friend the very best one I have ever had the pleasure of knowing? Simple. It’s heart. His was unmatched and bigger than anyone else I have known in my 39 years. You can’t measure heart. There is no metric that can adequately define it or quantify it. My friend was all heart. That is why he was such a great teacher. Ask any student who had him and the answer is the same: “Mr. Miller was the best.”. No doubt. The best. My friend Arty Miller was all of these things and more. There is no equation that can measure that. Notice that poem does not mention data, or numbers? Why not? Simple: There is no test a child can take that can demonstrate the effect a great teacher like my friend has. My heart is breaking – and has been for some time now, that our profession is moving in a direction that values numbers above all else. Arty often shared his frustrations with me over this. He never spoke out. He never complained. He soldiered on and accepted every rating he received, and yes – many of them told a different story about his ‘effectiveness” than you would think… yet he kept doing the best he could. Arty confided in me on more than one occasion that he wasn’t sure he could keep going on teaching, not because of his students, not because of his workload, but because of a system that seemed to take more and more heart and soul out the profession he had poured ALL OF HIS into. My friend Arty was the best teacher I have ever known, and every student who sat in his class can corroborate that. If I were not here to share that, and if you went by the rating system that he was judged under, he would just show up as another average educator. My friend Arty wasn’t average. He was the best. He is what every teacher should be. My friend was all heart and his teaching was testament to that. You don’t have to take my word for it though. All the evidence you need to see that truth is the sadness and devastation his loss has created in our community. I would share with you EVERY note, comment and post that parents, students and fellow teachers shared with me over the past two weeks, but I just don’t have the bandwidth to it. I love you, my friend. Rest in piece. I will never be able to walk down into your classroom again to share a story or give you advice. The world many of us woke up into this morning is a diminished one. I vow to make sure we work towards making it a better one, in your name. Godspeed Arty… heaven’s gain is our loss.